The Professional Footballers' Association plans to send proposals to Uefa calling for European teams to use at least three "homegrown" players in starting XIs. The union will discuss the issue at its annual general meeting on Wednesday amid concerns BT Sport's record £897m European TV deal could increase pressure on managers to use ready-made players rather than youngsters. "Some of the financial prizes for rising one place in the Premier League are so high now that clubs will jeopardise their youth in order to get those financial rewards." 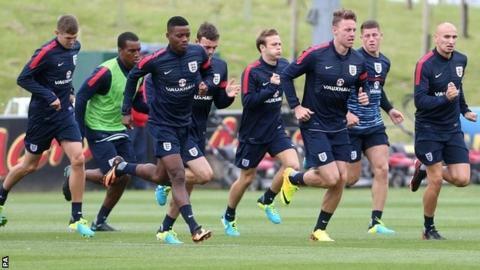 BBC Sport has revealed the number of English under-21 players in the Premier League has dropped to a new low. And some of Europe's other big five leagues have also seen a fall in the use of young players over the past eight years. But European Union laws have prevented previous attempts to introduce quota systems. The PFA hopes a Europe-wide plan for the inclusion of three players educated by the club for three seasons between the ages of 16 and 21, and regardless of nationality, would avoid potential legal problems. Uefa already has limits on "non-homegrown" players in teams' Champions League squads but it said any decision on such a quota would need to be taken by the relevant domestic competition, and the Premier League is understood to be against it. It says an average of between three and four English players start matches currently, which does not include players from other UK and Irish nations who might be considered "homegrown". And it is determined to produce quality English players through its £320m Elite Performance Plan and has a rule in place meaning each top-flight squad of 25 players must not include more than 17 "non-homegrown" players. The PFA says five out of six players who join clubs in England full-time at 16 are out of the game by 21. Chesterfield defender Ritchie Humphreys will officially become the new PFA chairman at the AGM, replacing outgoing chairman Clarke Carlisle, who has retired from playing. And a number of other new appointments are expected to be announced. Humphreys will also join the Football Association commission attempting to improve the fortunes of the England team. BT's record-breaking three-year deal to show all Champions League and Europa League matches from 2015 will form a backdrop to discussions. Although more money being fed into the game is thought to be welcomed, there is also a concern it could increase the disparity between player earnings in the Premier League and Championship compared to Leagues One and Two. Humphreys, 35, spent most of his career playing for Hartlepool, having left Sheffield Wednesday when he was 23 in order to gain more playing time. Other issues to be discussed at the PFA's headquarters in Manchester will include player safety in the aftermath of Tottenham goalkeeper Hugo Lloris playing on against Everton despite being knocked unconscious. The lack of black managers in the top four divisions will also be high on the agenda. Only three non-white bosses are employed and there is a frustration from the PFA that an assembled group of already qualified coaches have not gained recognition from the Premier League and Football League.